Leadership Initiatives is continuing to provide Nigerian business owners with the resources necessary to expand their businesses and provide new opportunities for their community. LI would not be able to do this without your tremendous support. These new businesses are allowing the younger generation to go to school and continue the cycle of positive change that you are helping initiate. Fish farmers are just one of the many business partners that LI is working with in Nigeria. Through LI's help, local fish farmers are able to provide their community with nutrient dense food and also employ local community members. Family members of the owners are also able to attend school now and pursue better lives. Right now Shenu Gagare has more than 20 people directly benefiting from his business. Because of wonderful people like you, LI is able to transform lives across the world by providing people with opportunities and connecting minds to create change. This change goes a long way and will affect future generations. Once again we would like to thank you for your fantastic support. Due to your tremendous support, more lives are changing for the better each day. It is almost the end of 2018 and we are excited for what the new year will bring. Once again we would have never been able to touch lives around the world without your amazing support. I'd like to share with you a story from an IBIP student about her experience with Leadership Initiatives. These experiences could not be possible without your support. "My time at Leadership Initiatives began two years ago when I attended the Global Youth Innovators at Initiative at the University of Chicago. During my time spent there, I had my first opportunity to work with entrepreneurs in Nigeria to help them implement solutions into their business so that they could grow and thrive in their communities. Greatly humbled and impassioned by this experience, I chose to form an International Business Internship Program team with four of my most determined classmates/friends. 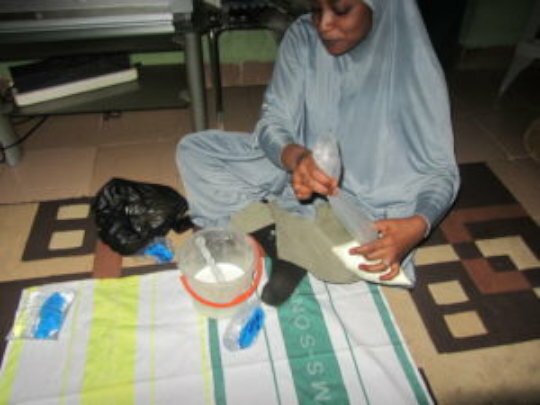 We began working with an ambitious young woman named Zainab, who runs her own yogurt business in Bauchi State, Nigeria. After having the opportunity to meet Zainab through Skype and see, first hand, what a hard-working, dedicated individual she is, my team felt compelled to help her in any way we could. Since then, we have developed a new, consistent recipe for her yogurt drink, created a marketing plan with a business name (Golden Spoon) and logo design, and are currently working to implement these solutions and develop a natural and safe way to preserve her product. The IBIP program has given me the amazing opportunity to make a difference across the globe while simultaneously getting to form authentic relationships with astounding individuals." This student's connection with Zainab could have not been possible without your help. Due to the growth of her business, Zainab is now attending University. Zainab, like all of our business leaders, is dedicated to helping her community grow through different resources, changing the lives of those around her and generations ahead of her. Once again we thank you for taking part in changing lives around the world through your contributions. By supporting us you are helping students gain life-changing experiences and helping people like Zainab create better lives for themselves and those around them. Thank you again for your kindness.